One of the most ambitious phones in Samsung’s Galaxy A series, the Galaxy A80 is listed in Geekbench with 8 GB of RAM and a Snapdragon 675 processor. Samsung, after entering the smartphone market and dominating the middle segment of the Chinese manufacturers, the 2019 Galaxy A series does not put its best after. Although the company has introduced many models in the Galaxy A series so far, there are still many models that are still waiting for the day to come. One of the smartphones that Samsung is planning to introduce soon is the Galaxy A80. 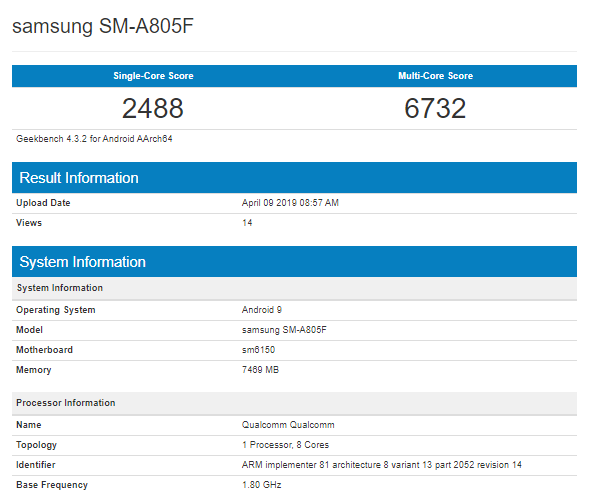 We have little information about the device, the model number of the SM-A805F Geekbench’ta appeared in the processor, RAM and other issues provided the first information. The device will have a Snapdragon 675 processor and 8 GB of RAM. According to the list dated April 9, the device works with the Android 9.0 Pie operating system, which, surprisingly, has a One UI interface. Considering that the device is rated 2488 and 6732 in single core and multi-core performances, we can say that it will be one of the most powerful devices in its level.